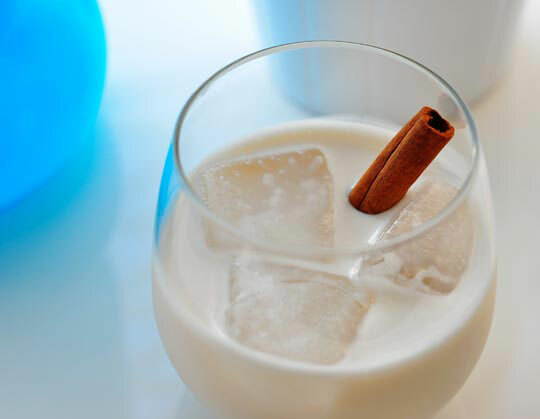 My mother taught me this easy horchata recipe because she knows how much I love this “agua fresca” (refreshing flavored water). There are many flavors of agua fresca. Some of my favorites are: jamaica (a tart drink made from hibiscus flowers), fresas (strawberries), sandia (watermelon), melon (cantalope) and of course, horchata, made from rice and cinnamon. Put rice and cinnamon sticks in blender and fill blender with enough water to cover ingredients. Allow to soak for a 1/2 hour or so. Blend ingredients in blender. Strain mixture into pitcher and pour additional water through strainer (enough to fill pitcher 3/4 of the way). This will extract the flavor from the rice mixture. Dispose of the remaining rice in strainer. Stir in sugar to rice drink to taste. This is a sweet drink so the more sugar the better! Chill and serve with ice. For a sugar-free version, you can substitute sugar for Splenda. Also, for a little kick, why not add a little rum to the drink and turn it into a summery cocktail? Hip chicks like us love to put our own unique spin on our recipes, don’t we? So tell us: What other agua frescas do you enjoy? How would you modify this recipe to make it even more special for your party guests? Share your thoughts with other fellow hip chicks by posting your ideas in the “Comments” section below.